Join our delicious Tastes of Brooklyn events this spring. Start with our first-ever Tastes of Gowanus Food and Drink Crawl on April 13. Take a stroll along the industrial, artistic, historic streets near the Gowanus Canal waterfront. Discover culinary gems tucked between Park Slope and Carroll Gardens, just off the R train at Union Street and east of the F/G trains at Carroll Street. Buy tickets online now or go in person to Lavender Lake, just a few blocks from Carroll Park and the F/G train at Carroll Street. Stop by the Gowanus Dredgers Boathouse for Earth Day family fun and Arcane Distilling for Fernet cocktails, plus our student-run Hip2B Healthy Market and fresh juice stand! See the online map here! 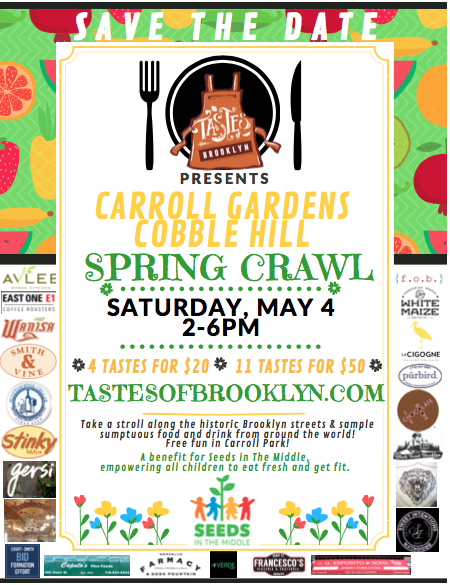 On May 4th, our popular Carroll Gardens-Cobble Hill Crawl returns - just in time for Cinco de Mayo. Explore fine cuisine and cocktails in these charming historic neighborhoods, just blocks south of the Brooklyn Bridge and Borough Hall. Free fun in Carroll Park! See the Tastes of Gowanus online map here. Check out our culinary talent so far and plan your walk! Tastes of Brooklyn from DigitalTechCINEMA on Vimeo. Founded by local food establishments and Seeds in the Middle, the Tastes of Brooklyn promotes local culinary talent along with supporting youth in underserved Brooklyn's food deserts so they can create healthy places to live and learn. We are proud to support and promote Brooklyn's small businesses and food entrepreneurs from around the world in Brooklyn - both the old and new. Guest chefs welcome!Contact tastesofbrooklyn@gmail.com for information. A special thanks to all who took part in our Carroll Gardens-Cobble Hill Crawls 2016, 2017, 2018, and our inaugural event on October 20, 2016! Thanks to all of our Gowanus participants for a phenomenal culinary debut! More to come.